Samsung's new Galaxy Tab challenges the iPad with a smaller, Android-powered design, but comes up short on value, and feels like a supersized phone without the phone. Remember how cynics called the iPad an oversized iPod Touch? We all know now what a ridiculous assertion that was. But the comparison is more apt for the Samsung Galaxy Tab, the second consumer tablet PC to become available from all four national carriers. The Tab is essentially a large, Galaxy-class cellphone without the cellphone. This is not necessarily a bad thing, especially if you don’t already own a smartphone with a 3.5-inch screen or larger. Even though the Tab is a lovely package of overgrown smartphone technologies, its biggest advantage as a tablet is its immediate access – it fits neatly into the inside pocket of a suit or other jacket or overcoat. That may sound simplistic, but the Tab’s pocket friendliness could end up being its biggest draw. 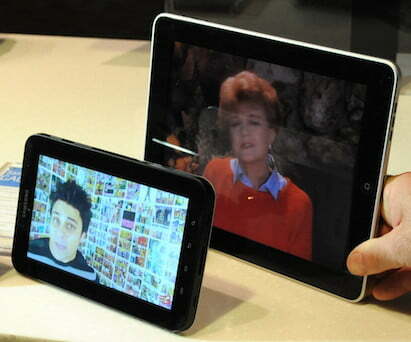 As you no doubt know by now, the Samsung Galaxy Tab has a 7-inch, 1024 x 600 pixel screen. It runs Android 2.2 Froyo OS, and shares the same Cortex A8 1 GHz Hummingbird processor powering Samsung’s Galaxy smartphones. It’s got 2GB internal memory, and the Sprint version (the one we reviewed) comes with a 16GB microSD card pre-installed. It’s equipped with 802.11 b/g/n, Bluetooth 3.0, the Sprint mobile hotspot that can support up to five Wi-Fi users, and, disappointingly, a proprietary iPhone-like jack rather than a microUSB connector. Up front is a 1.3 MP camera for QIK video chatting, a 3-megapixel sensor with a single LED flash on the white plastic on the rear. 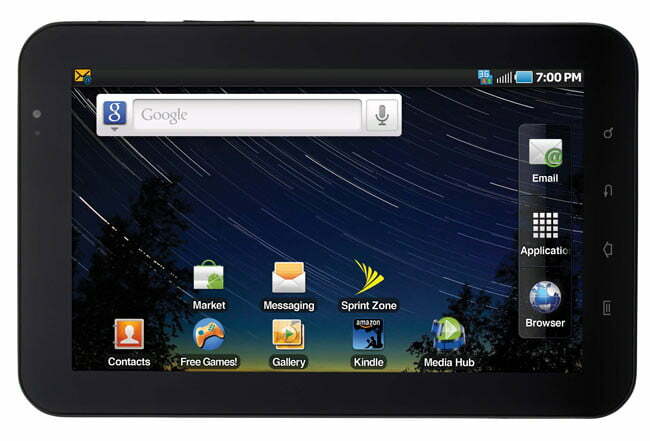 Notably, all Android tablets will also support Adobe Flash. Currently, only combined 3G/Wi-Fi versions are available, although Samsung has indicated a Wi-Fi-only Tab will be available at some point. At 13.6 ounces, the Tab is heftier than you’d expect, but still about half the weight of the iPad. We spent an afternoon with the Tab perched in the inside breast pocket of a suit jacket, and a week with it settled in the inside pocket of a leather jacket, and in neither case did we feel overburdened. Only two-thirds of the Tab’s length fit inside the suit jacket pocket, though, and the exposed top third rode a bit high – not uncomfortably, but if we leaned over, it may have slipped out. The Tab also will fit in the thigh pockets of a pair of cargo pants, as well as the rear pocket of any pair of slacks or jeans. We would only trust it in deep cargo pockets, though, and even then, the Tab will slap your thighs (not in a good way), while walking. As for rear pockets, do you really want to take the chance of accidentally sitting on your Tab? The Tab is a slippery devil; you have to be careful removing and replacing it in a pocket. It cries out for a case, but any added protection short of a Wrapsol or other clear plastic wrap and Tab would no longer fit in the aforementioned pockets, which could be a problem.